The Vaseline 'Spray & Go' moisturiser is the only body moisturiser you will ever need. Trust me. Throw out everything else you own and forget they ever existed. I'm now onto my fifth can of the stuff and considering it's 6.99€ a can and i'm cheap as hell, yano it's gotta be good. I'm a massive fan of body butters and just full body moisturisers in general because they leave your skin feeling so soft and silky but I'm pretty lazy and body butters require a lot of effort. They literally take a lifetime to soak in so you're just kind of sat there in your towel chilling until the time comes for you to throw on those pjs and relax. 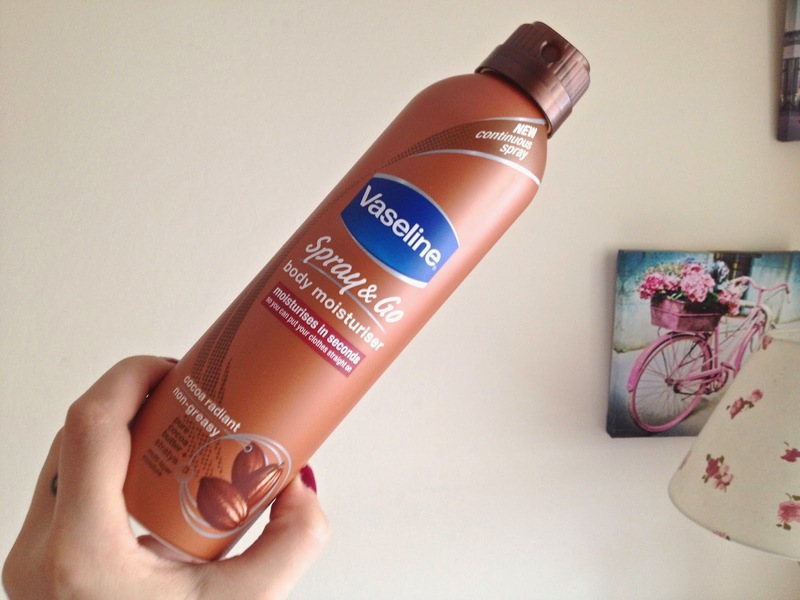 The Vaseline 'Spray & Go' however is the ultimate lazy girl companion. Hop out of the shower, dry off and spray. I actually spray quite a lot which is probably why I go through so many cans. It dries instantly and I mean instantly. By the time you've finished spraying your second arm, the first is dry and you're ready to go. I was a little wary at first. These things alway claim to do one thing but the reality is a whole other story. The best thing? Your back - I always find it so hard to moisturise my back because it's awkward (like tanning your back blaaahhh) but with this you can actually reach with no weird body movements required to do so. Ah the simplicity of it all. It sprays really evenly across your skin too so there's no chance you'll miss any part of your body. You'll know when you're getting to the end of the can because it no longer sprays like a nice mist but just kind of squirts unevenly, every where! My skin has felt amazing since i've started using this. It's always so soft and it smells pretty good too. The brown can is a cocoa scent (my fav) and it lingers on my skin all day. 4 hours after I sprayed it someone actually asked me what perfume I was wearing!! Perfume? Nah, moisturiser. Have you guys tried this or one of the other scents? Let me know below, I'm a sucker for the brown one and should really try the other scents out. This really does sound amazing!! I need to try ASAP! I've wanted to try this for so long, I hadn't even thought about it being perfect for moisturising my back - the only time mine gets any attention is when I can persuade my boyfriend to put some Dove on it for me! Definitely going to pick this up at some point. Great review! I bought this but haven't used it yet, now I can't wait! I've always wanted to try this, I'll think I will pick up a bottle next time I'm out shopping! Hi JesskaDenise, what's product good for men? I love Vaseline spray and go! This was in my favourites a few months ago. I received it in a Glossybox and genuinely love it. Usually I haven't got time for body lotions, but this is fab!